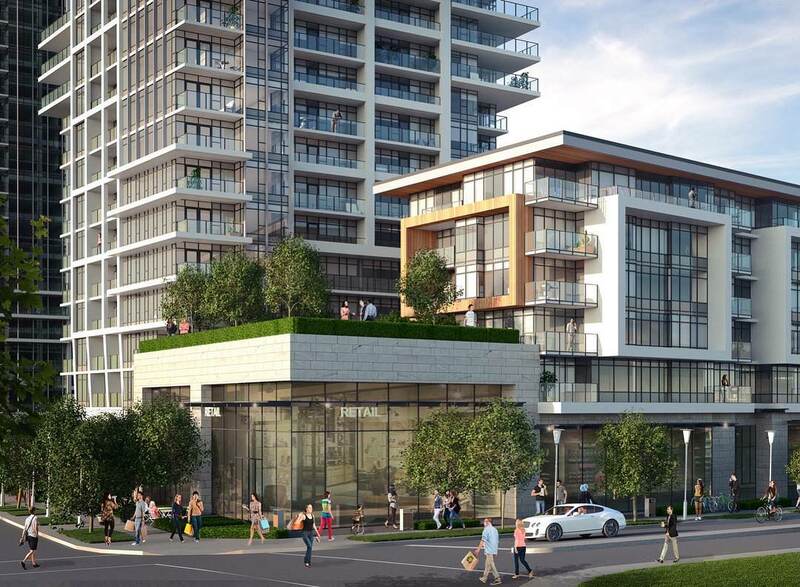 New renderings have been released by Adessa Visuals of Tien Sher Group’s upcoming Whalley District near 108th & King George Blvd. 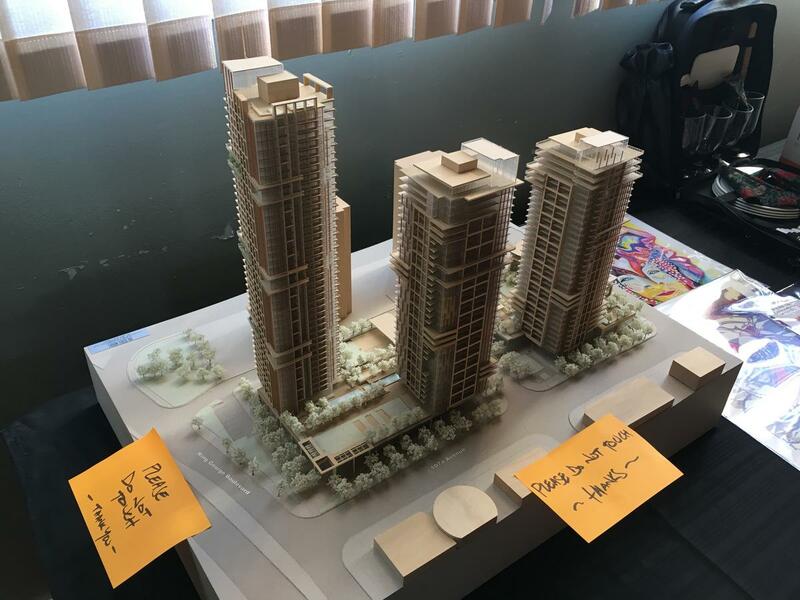 The 3-tower project which currently has preliminary approval, is expected to begin on its first phase – a 35-storey condo tower + 6-storey condo low rise with retail at grade – later this year. 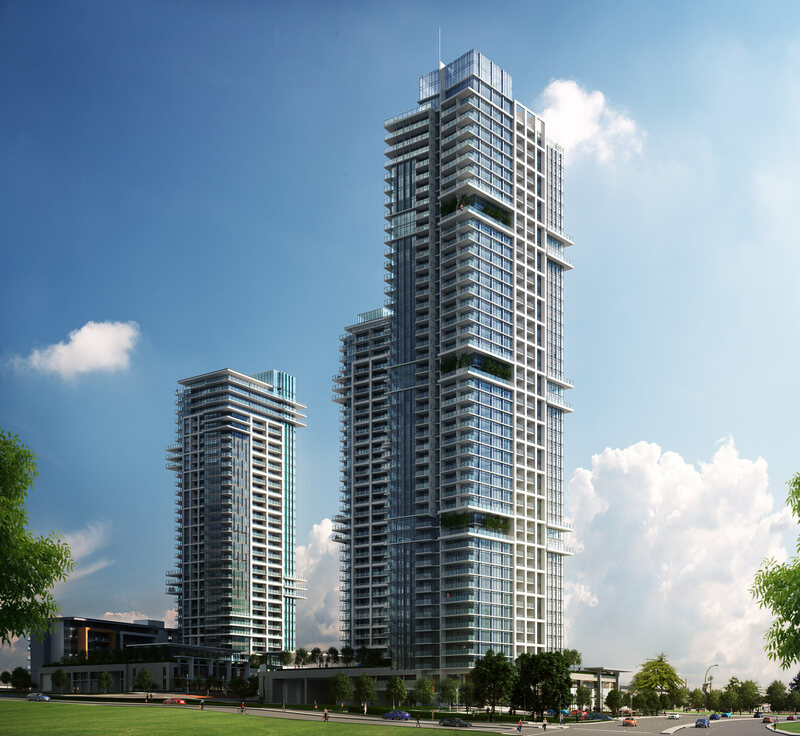 Adessa Visuals specializes in creating photo-realistic architectural renderings for projects across Metro Vancouver. These latest renderings help to bring the project to life and visualize the finished product. From the renderings, it is clear to see how transformative of a project this will be for the area of 108th & King George Blvd – which has become notoriously run-down in recent decades. 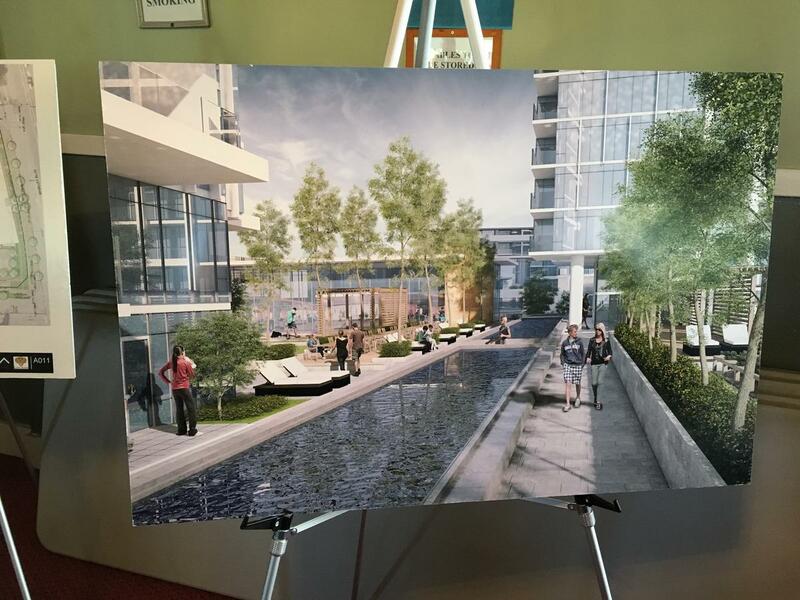 In addition to condos, the project will also bring retail, community arts space, and an outdoor plaza. This development will add to developer Tien Sher Group growing number of buildings in the area, having already built the 5-storey Quattro buildings across the street on Whalley Blvd, and set to begin on another 5-storey project across from the site at Whalley Blvd & Grosvenor Rd by next year. 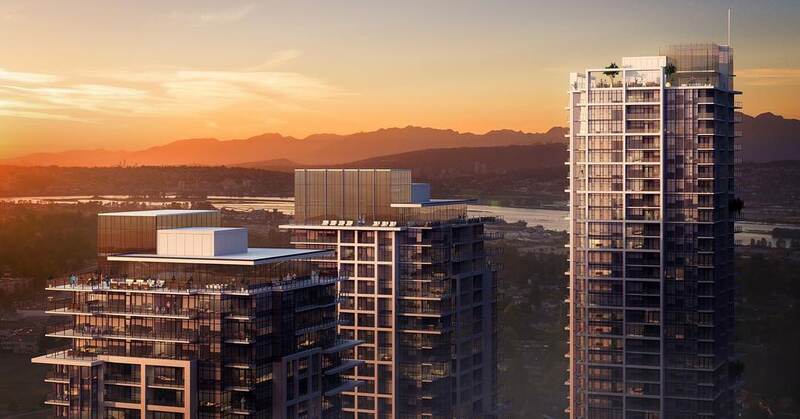 Whalley District will be phased, starting with the 35-storey tower at the east end of the site, and then working west to complete the 37-storey, and finally 46-storey signature tower. While the first tower could begin later this year and complete by 2021, it is expected the entire development will not be complete until around 2025. View looking west from Whalley Blvd & 107A St at first phase of project featuring a 35-storey condo tower and 6-storey condo building with retail at grade. A 5-storey condo building proposed for the corner of Grosvenor Road and Whalley Blvd received 1st & 2nd readings at Council Monday night. The project, which was first announced back in April 2017, and is being developed by Tien Sher, will become the developer’s 6th building in the area, after Quattro 1, 2, 3, Balance, and the now under construction Venue. 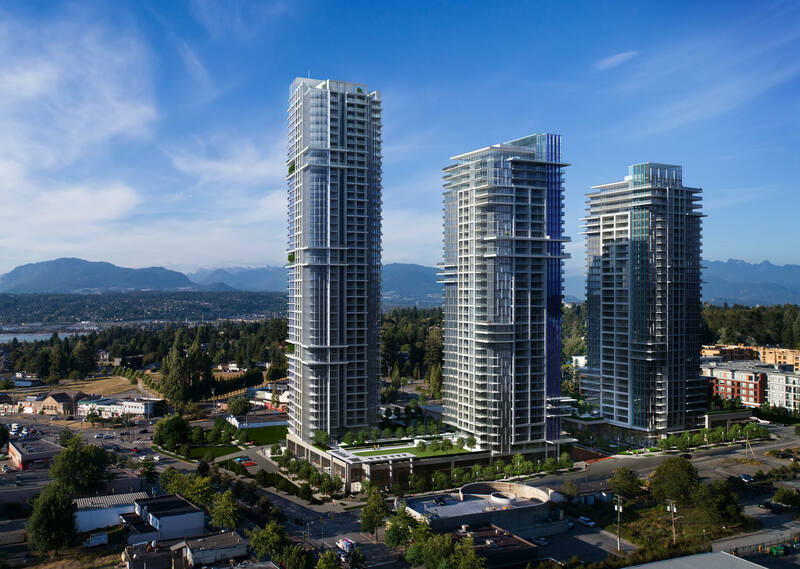 Tien sher’s other major project in the area Whalley District, was recently approved back in June, and should begin construction on its first phase in 2018. Ground-oriented units are proposed to be oriented toward the street with their own front door, entry gates, and semi-private outdoor space, which will help to urbanize the streetscape that the building fronts. The project is expected to be completed by late 2019. Tien Sher Group’s long awaited ‘Whalley District’ is finally heading to Council on Monday June 12 for 1st & 2nd Readings. 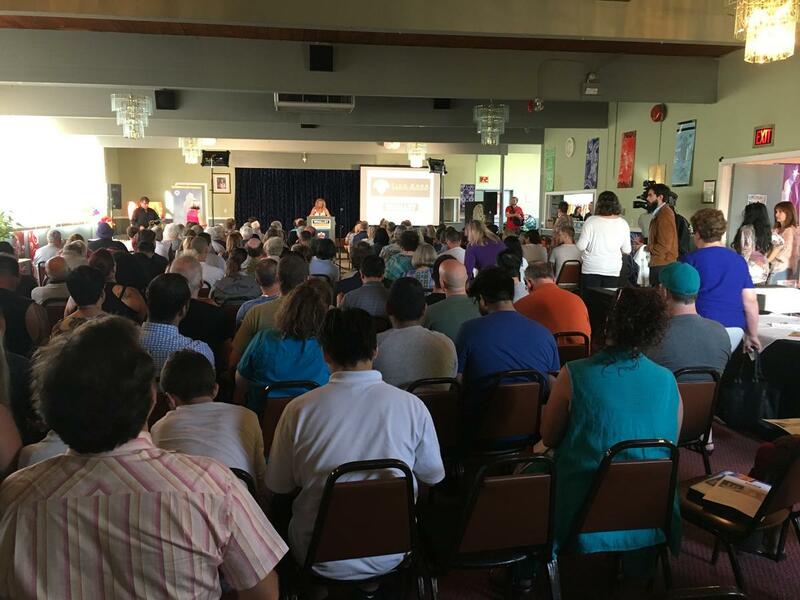 The project which first appeared in 2012 under a previous application, and then again in 2015 under its current application, is aiming to kickstart a revitalization of the historic heart of Whalley near 108th Ave & King George Blvd. A 35-storey condo tower with retail, arts, and plaza space below. A 426-sq. metre (4,585-sq.ft.) 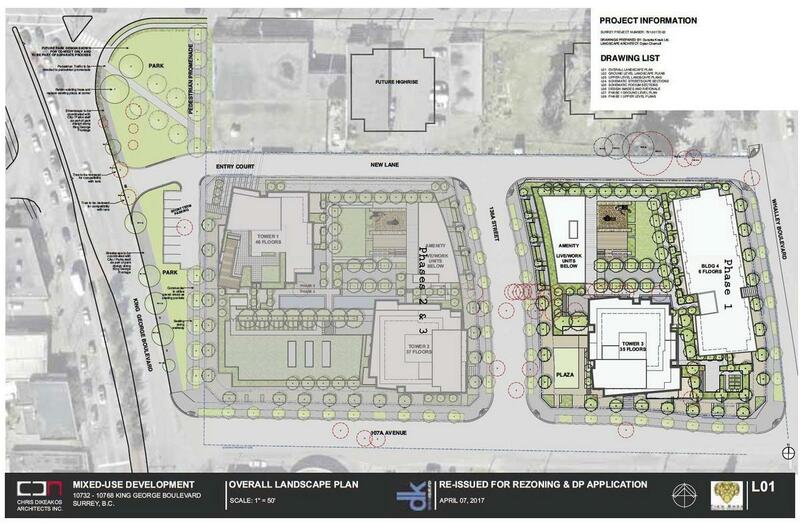 street-level outdoor plaza at the intersection of future 136A Street and 107A Avenue. The plaza is intended to be used as a public gathering space where frequent weekend entertainment, education, and art events can take place. 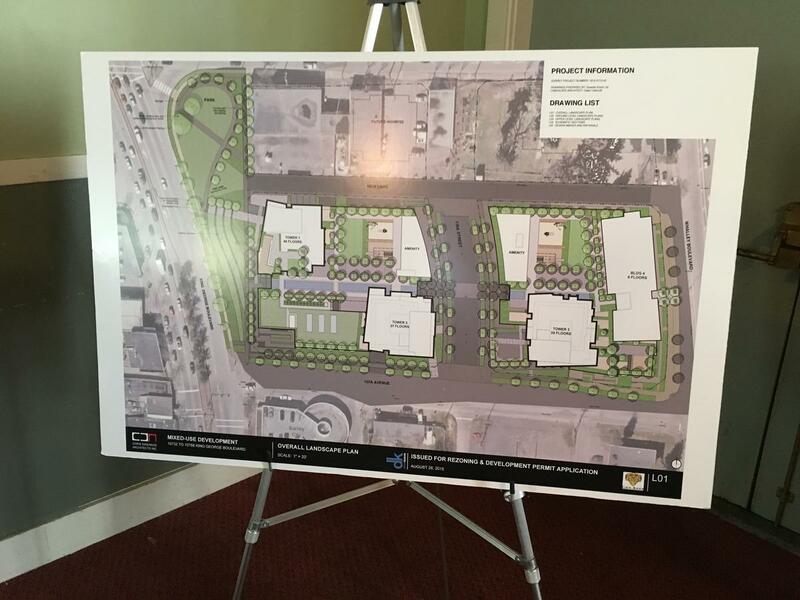 The applicant has proposed to partner with a non-profit arts and culture organization (Flamingo Square Arts Connection) to activate the space. 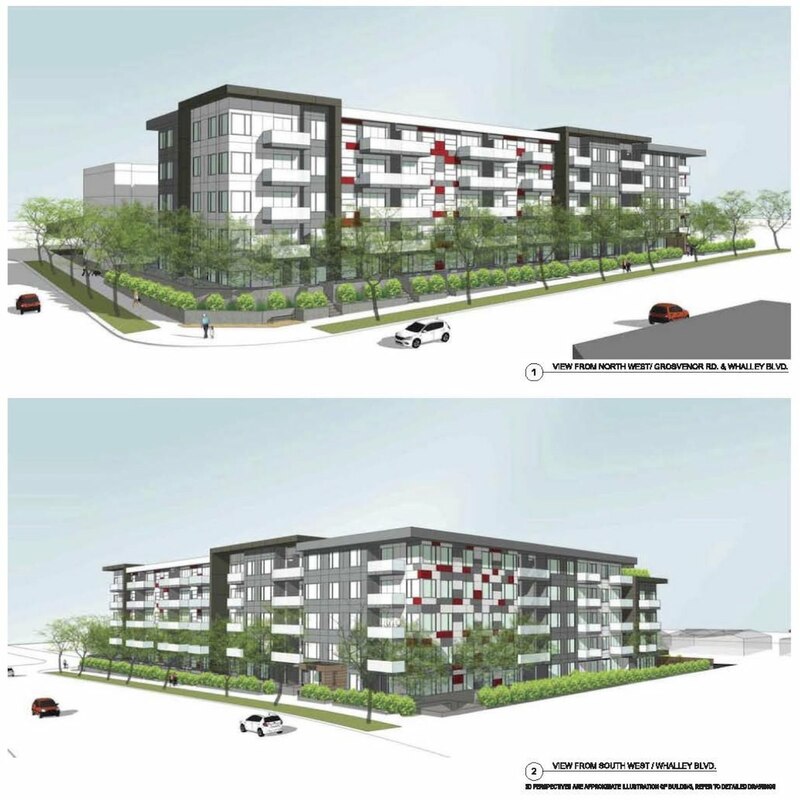 Phase 1 will include a total of 349 dwelling units. The commercial component for Phase 1 will consist of 1,960 square metres (21,095 sq.ft.) of floor area. A 46-storey condo tower with retail at ground level, including a large-format grocery store. It is expected that Phase 1 of the project will get underway by Spring 2018. 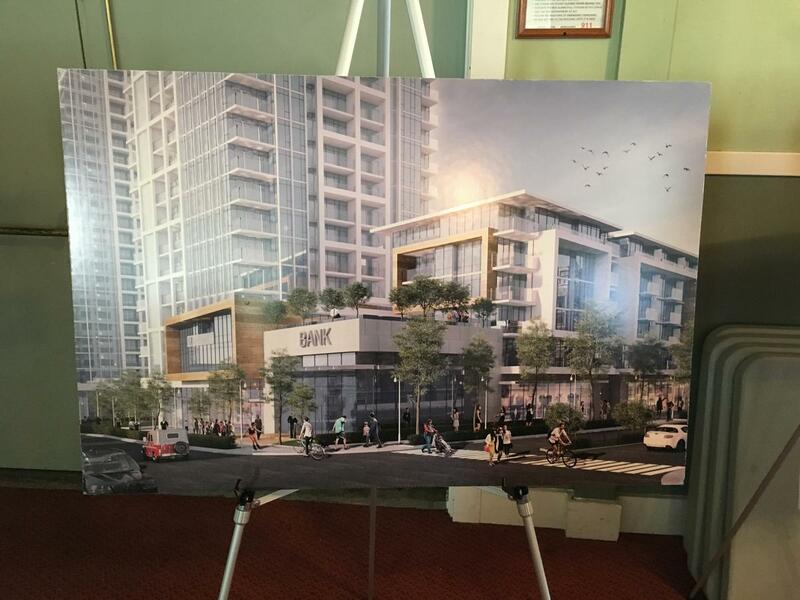 Developer Tien Sher Group held a packed Town Hall meeting today to present their vision and plans for a revitalized Whalley. 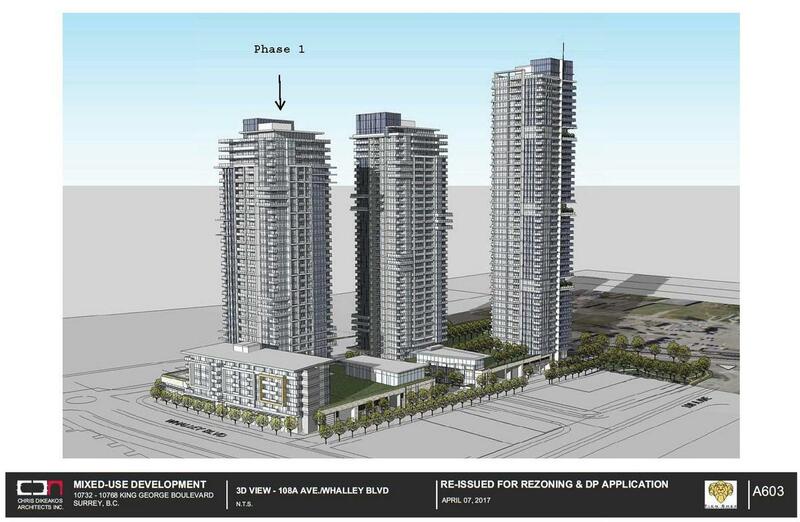 Dubbed ‘Whalley District’, the plan is for a development consisting of 3 high-rise condo towers and 1 low-rise condo building over a mix of commercial, retail, community, and plaza space on the south-east corner of 108 Ave and King George Blvd in the historic heart of Whalley. 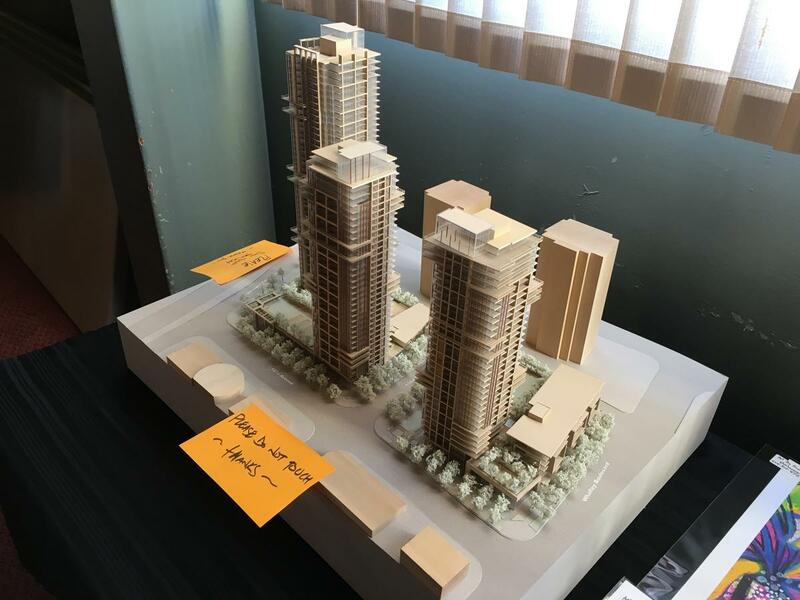 Tien Sher has already developed the neighbouring ‘Quatto’ project at Whalley Blvd and 108 Ave, along with ‘Balance’ on Grosvenor Rd, and the currently under construction ‘Venue’. While news of the development is not new, having been under application since 2015, what is new is their now announced plans to partner with a local arts group to bring a significant arts component to the project as a means to revitalize and bring culture to the Whalley area. It is expected that community space will be provided in the development for the non-profit arts group and their programming. At the meeting, Tien Sher presented their plans for the introduction of a pedestrian-only street through the centre of the development dubbed the ‘Flamingo Block’ on what would be future 136A St. The Flamingo name comes from the long-standing Flamingo Hotel which has been on the site since the 1950’s, but will be torn down to make way for the development. At present, the City of Surrey wishes to see this as a future road open to traffic, however Tien Sher is leading a petition to build it as a pedestrian-only street where public art, cultural programming, and gathering could take place. This would compliment an additional proposed plaza/park on the corner of 108 & King George, also to be build as part of the development. 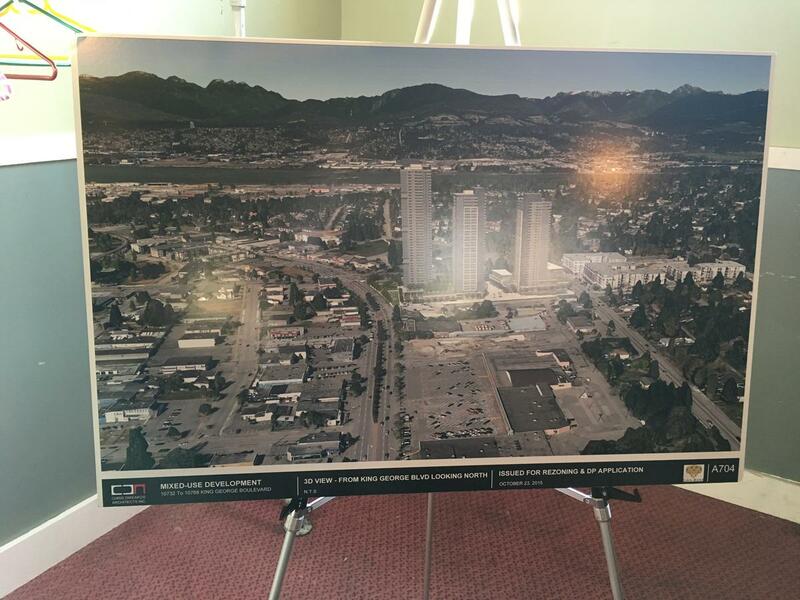 The project, which is expected to appear before council for preliminary approvals and public hearing before summer, is to be built in phases beginning with a 6-storey condo building with retail below along Whalley Blvd at the east end of the site. This will then be followed by phases 2-4 consisting of a 35-storey, 37-storey, and lastly a 46-storey condo tower(s) above commercial, retail, and arts/community space. It is expected that the first phase of the project will break ground by Spring 2018. In the meantime, the arts group is looking to engage arts initiatives around the City Centre right away, and is seeking anyone who would like to become involved. Ideas for arts initiatives that can be introduced in the City Centre are wide ranging, from murals, public art, beatification projects, community groups, activities, and more. 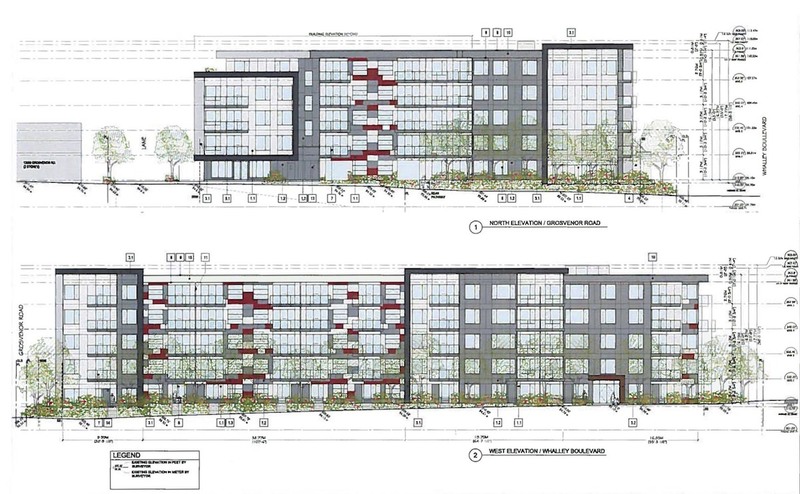 A new development application has been submitted by Tien Sher Group for a 5-storey 122 unit condo building at 13660 Grosvenor Rd on the corner of Whalley Blvd. 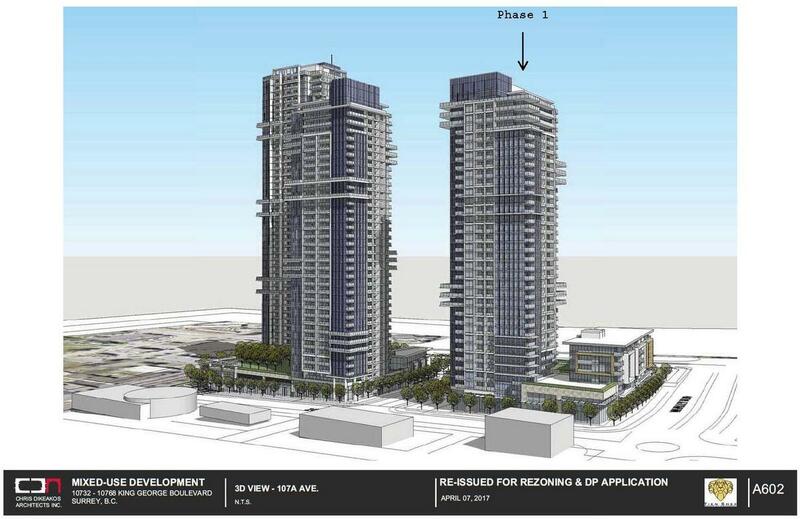 This application adds to Tien Sher’s growing presence in the neighbourhood, having already developed the 4-6 storey Quattro development at 108th & Whalley Blvd, the 4-storey Balance development on Grosvenor Rd, and the 5-storey, under-construction Venue development on 108th Avenue. 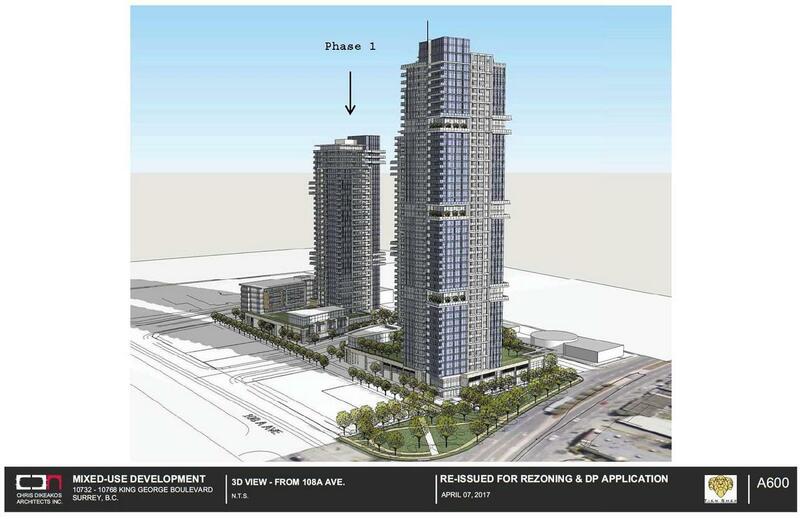 Tien Sher also has under application their landmark 41, 35, 30, and 28-storey mixed-use development on the south-east corner of 108th & King George Blvd, which is expected to proceed in phases over the next decade. At this time, there are no further details on the latest 5-storey development, but it appears based on the application that the building is being proposed as entirely residential with no retail component. Tien Sher’s previous Quattro development a block away provides a precedent as to the built form this project is likely to take. 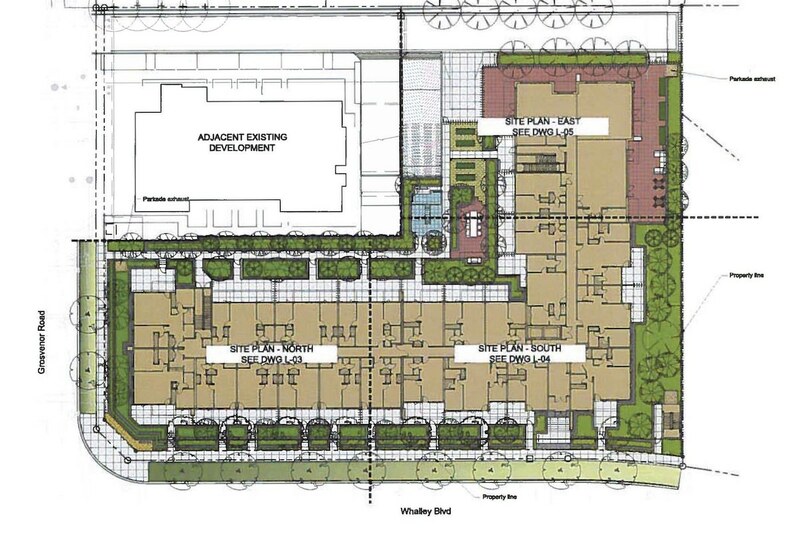 Given the project’s location, it is possible that the City will request that ground-level retail be included along Whalley Blvd similar to Quattro. It would make sense in this location, given the site’s proximity to 108th and King George, and existing commercial land-use directly across the street. 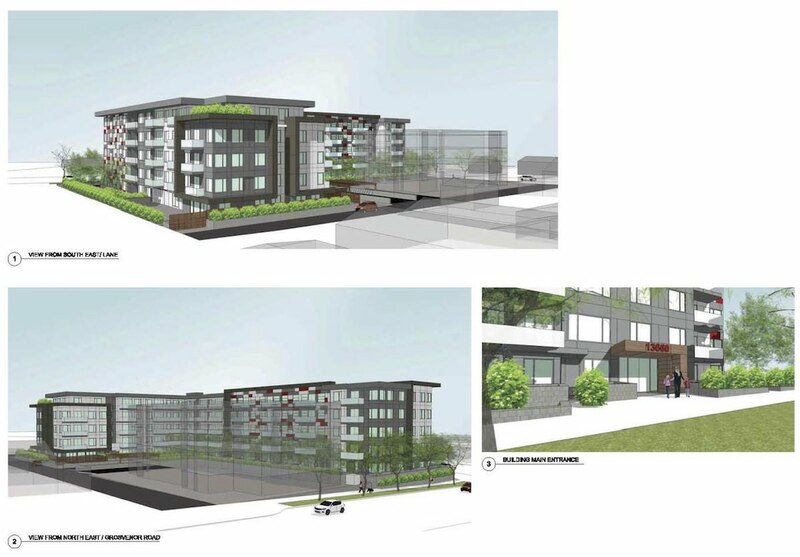 As proposed, this project will continue the 5-6 storey street wall established along Whalley Blvd by Quattro to the south, and add to the densification of the area in the vicinity of Gateway Station. The site is designated low-mid rise 2.5 FAR under the City Centre Plan. 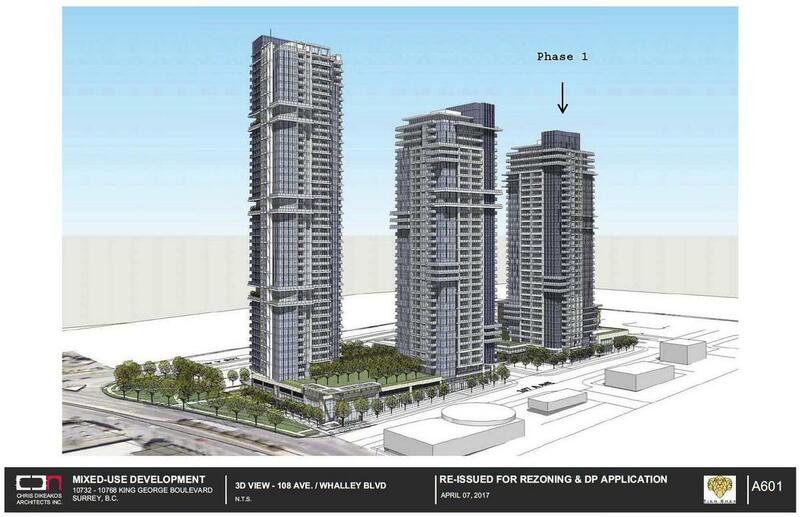 Tien Sher’s proposed 41, 35, 30 & 28-Storey mixed-use development currently under application at 108th & King George. Subject Site in relation to other Tien Sher projects in area.